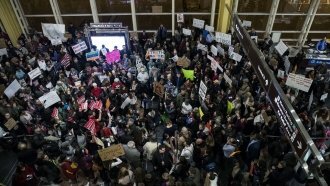 Two federal judges recently halted the latest iteration of restrictions, which broadly suspend travel for most nationals from eight countries. Another federal judge blocked the Trump administration's latest travel restrictions — partially. U.S. District Judge Theodore Chuang ruled those restrictions could cause irreparable harm to the travelers they bar. He also noted an injunction "serves a significant public interest" and that the administration didn't prove how national security can't be maintained without the restrictions. The Maryland judge also said the government didn't prove national security is now the primary purpose of the restrictions. He cited Trump's prior rhetoric about banning Muslims. The Trump administration issued "tailored travel restrictions" in September, replacing its controversial travel ban. The new rules broadly suspend travel for most nationals from Chad, Iran, Libya, North Korea, Syria, Venezuela, Yemen and Somalia. Shortly before this latest ruling, a federal judge in Hawaii temporarily froze the restrictions on similar grounds, arguing the rules are discriminatory, among other things. Chuang's preliminary injunction doesn't apply to travelers without a "credible claim of a bona fide relationship" to someone in the U.S. or to nationals from Venezuela and North Korea. Even though the Maryland judge's order stopped the restrictions only for people who had such a relationship with someone in the U.S., the Hawaii judge's injunction had a broader effect. It halted implementation for every country affected — except North Korea and Venezuela — regardless if the traveler has a relationship with someone in the U.S.
A Justice Department spokesperson said both rulings could have serious consequences for national security.